I recently visited the National Archives in Washington D.C., which happened to be running the exhibit, ‘Spirited Republic: Alcohol in American History’. The exhibit delves into the history of alcohol in American society. 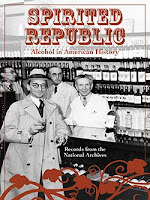 It offers a look at the evolution of the Federal government’s policies, including how the government regulated, prohibited - and at one point even promoted - alcohol. A couple of highlights that healthcare folks might find intriguing: A "gold cure" was one of the most popular treatments for alcoholics (or “dipsomaniacs” as they were called back then) during the late 19th century. You can also view a prescription for whiskey for I. F. Johnson, dated January 3, 1924. During Prohibition the Volstead Act allowed for medicinal use of alcoholic drinks by patients who obtained a prescription from a licensed physician. Whiskey was touted as the new wonder-drug, used in the treatment of conditions as varied as tuberculosis, anemia, pneumonia, and high blood pressure. Adults could obtain an ounce of whisky every few hours at a cost of $3 (equal to $40 today) with their prescription. 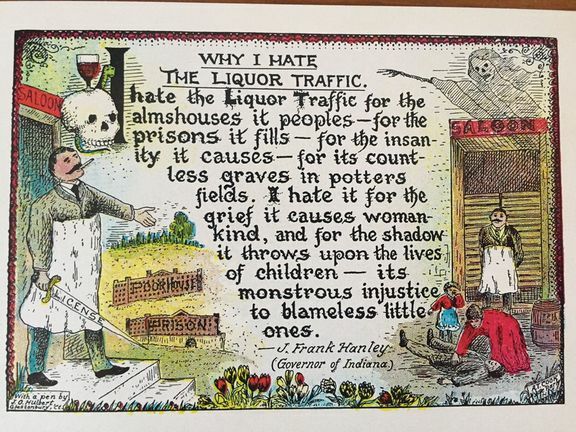 A 1918 quote by Governor Hanley of Indiana caught my eye. 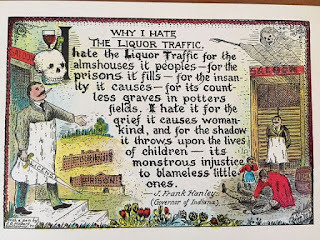 'Why I hate the liquor traffic' states, "I hate the Liquor Traffic for the almshouses it peoples – for the prisons it fills – for the insanity it causes – for its countless graves in potters fields. I hate it for the grief it causes womankind, and for the shadow it throws upon the lives of children – its monstrous injustice to blameless little ones." My visit to the National Archives was actually lunchtime detour from the American Academy of Pediatrics National Conference. A key Conference theme was identifying toxic stress in children and promoting resilience. Did you know that adverse childhood experiences (such as parental drug or alcohol addiction, child maltreatment, or exposure to domestic violence) increase the chances of physical and mental health issues in children that can persist into adulthood? The higher the number of negative experiences a child has, the greater the likelihood of these physical and mental health problems. A rough childhood even raises the risk of premature death in adulthood through changes in the genome, hypothalamus-pituitary-adrenal axis, and immune system. The Adverse Childhood Experience (ACE) Study offers 10 questions that can help healthcare providers assess toxic stress. One of these questions screens for people in the child’s home with problem drinking, alcoholism, and drug abuse. The HOPE, or Health Outcomes of Positive Experiences study, shows that emotional connections built during infancy (through activities such as reading together), childhood (providing opportunities to play, taking time to talk, and family dinners), and adolescence (developing safe and nurturing relationships with adults outside of the home, such as grandparents or teachers) build resilience. These connections buffer children against the storms of unsafe or unstable environments. They help children learn social and emotional competence, and build the experience of resilience. So what is the one new thing I want to try out to help high-risk families in my practice build emotional connection and resilience? The HOPE study had many suggestions for clinicians, but one struck me as particularly intriguing and unique. Asking parents during clinical visits, “What are you most proud of about your child?” As a pediatrician and a mom, that question gave me pause – both professionally and personally. To quote the great Dr. Seuss in The Lorax, “Unless someone like you cares a whole awful lot, Nothing is going to get better. It's not."